AIMS AND OBJECTIVES: Our aim is to assess the clinical usage of Nebulization and Antibiotic therapy in COPD. 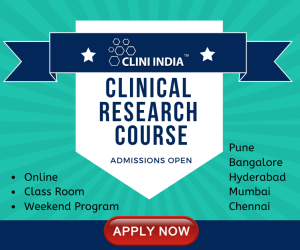 METHOD: An Observational, Prospective, Cohort study was conducted at a tertiary care teaching hospital, Telangana State, India. A total of 102 patients from the In-patient department of Pulmonology in Gleneagles Global Hospital, who were prescribed Nebulizers and Antibiotics and those who fulfilled the exclusion and inclusion criteria were selected for the study which was conducted for 6 months. All information significant to the study was collected from the case records and discussion conducted with the In-patients and bystanders during ward rounds with the support of a physician which were analyzed by SPSS software. Moreover daily follow-ups were conducted to assemble data on amendment in therapy, add on therapy, and clinical improvement. RESULTS: The Mean age was 66 years and Standard Deviation was 13 years of the population. 41% were smokers and 27% were alcoholics. The most commonly used Bronchodilator is Duolin with a percentage of 96%. The most commonly used antibiotic is Magnex Forte with a percentage of 41.1%. 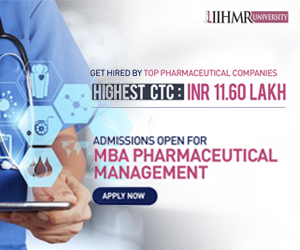 The most commonly used formulation is Orals with a percentage of 53%. 92% of individuals responded in a positive way after the Nebulization therapy with Oxygen therapy provided to them, as their SpO 2 levels with oxygen therapy changed to normal range. CONCLUSION: Nebulization therapy had more clinical improvement when compared to Inhalational therapy. The addition of corticosteroids had decreased the patient stay in hospital. Antibiotics added to the treatment decreased the frequency of exacerbations. Antibiotics added to the treatment decreased the frequency of exacerbations. The patient should be educated about the rational use of the drugs and decrease the risk and exacerbations of COPD. Chronic Obstructive Pulmonary Disease (COPD) is a major cause of chronic morbidity and mortality throughout the world. Many people suffer from this disease for years and die prematurely from it or its complications. COPD is the fourth leading cause of death in the world (Lozano R et al., 2012), and further increases in its prevalence and mortality can be predicted in the coming decades (Lopez AD et al., 2006). COPD is a major global health problem that increasingly constitutes a burden for the society and has large effects on health-care expenditure (Pauwels RA et al., 2001). The most recent definition of COPD according to GOLD is as follows: “Chronic obstructive pulmonary disease (COPD) is characterized by chronic airflow limitation and a range of pathological changes in the lung, some significant extra-pulmonary effects, and important comorbidities which may contribute to the severity of the disease in individual patients” (Mary Anne Koda-Kimble et al., 2005). Chronic obstructive pulmonary disease (COPD) is now the fourth leading cause of death globally, and the World Health Organization (WHO) has predicted that it will become the third most common cause of death in the world by 2030 (World Health Organization., 2008). In developed countries, current information estimates a prevalence of 8% to 10% among adults 40 years of age and older, whereas in developing countries, prevalence varies significantly among countries and is difficult to quote (Diaz-Guzman E et al., 2014). It is estimated that more than 210 million people have the disease worldwide (Bousquet J et al., 2010). Concerning a large number of subjects, COPD generates important health and social costs. However, although COPD is one of the most common chronic diseases and has a high health and social impact, it is still poorly recognized among the general public and also clinicians. Consequently, there is a major and urgent need to better understand this complex disease (Barnes PJ et al., 2014). India also has had the ignominy of experiencing the "highest loss in potentially productive years of life" worldwide in 2005 (Reddy KS et al., 2005). Crude estimates suggest there are 30 million COPD patients in India (Salvi S et al., 2012). India contributes a significant and growing percentage of COPD mortality which is estimated to be amongst the highest in the world, i.e. more than 64.7 estimated age standardized death rate per 100,000 amongst both sexes (Lopez AD et al., 2006). Mortality from COPD is higher in males and increases with age in those over 45 yrs old. In the USA, within the framework of the National Health and Nutrition Examination Survey (NHANES I), 1,301 deaths were analysed in a cohort of 5,542 adults. The presence of COPD at various GOLD stages was associated with the following risk of death, as defined by hazard ratio (HR) (Lius S et al., 2007). Patients with COPD typically have comorbid conditions, such as lung cancer, cardiovascular disease (e.g. ischemic heart disease, depression, muscle wasting, reduced fat-free mass, osteopenia, and chronic infections). One explanation for this is that tobacco use drives disease in multiple organs. These disorders contribute to a high disease burden and early mortality in patients with COPD. Deaths in individuals with COPD are frequently attributed to a cause other than COPD (Mannino DM. AS Buist, 2007). Active smoking is the main risk factor for COPD. The risk attributable to active smoking in COPD is thought to vary from 40% to 70% according to the country (Boutin-Forzano S et al., 2007). Exposure to pollution inside the home, in particular in developing countries, is an important risk for COPD (risk accounting for 35% of cases), due to exposure to smoke when cooking in particular for females (Postma DS et al., 1998). From an epidemiological point of view, males were classically more at risk of developing COPD in comparison with females because of their smoking habits. Progressively, however, and depending on the country, females who smoke as much as males seem to have an equivalent risk of developing COPD (Liu S et al., 2007; Mannino DM. AS Buist, 2007). Exposure to biomass fuels like crop residues or woods or animal dung is also widely prevalent in India. More than one-half of the world's households uses biomass fuels (Shohaimi S et al., 2004). Biomass fuels are now considered a major cause of the causation of COPD (deKoning HW et al., 1985; Salvi S. Barnes PJ, 2010). In India, 70% of the homes use biomass fuel for cooking and heating purposes in poorly ventilated kitchens, and the amount of particulate matter pollution generated by the burning of biomass fuel is extremely high. 90% of rural households and 32% of urban households cook their meals on a biomass stove (Salvi S. Barnes PJ, 2009; Prasad R et al., 2012). • Manage Exacerbations (Lozano R et al., 2012). These strategies include β2 agonists, the addition of anticholinergics, the intravenous administration of corticosteroids, antibiotic therapy when indicated, and the intravenous administration of methylxanthines such as aminophylline (Standards for the diagnosis and care of patients with COPD). Hospitalization of patients with COPD may be necessary to provide antibiotic therapy, appropriate supportive care and monitoring of oxygen status. Oxygen supplementation via external devices or mechanical ventilation may be indicated to maintain oxygen delivery to vital tissues (Voelkel NF. Tuder R, 2000). Antibiotic therapy has been shown to have a small but important effect on clinical recovery and outcome in patients with acute exacerbations of chronic bronchitis and emphysema (Fein A. Fein AM, 2000). Therefore, antibiotic administration should be considered at the beginning of treatment for exacerbations of COPD. Oxygen status can be monitored clinically, as well as by pulse oximetry (Voelkel NF. Tuder R, 2000). • They are able to provide a much larger dose of medication and can be used for not only bronchodilators and corticosteroids, but a wide range of antibiotics and other medications. • They require less intensive training for elderly chronic obstructive pulmonary disease (COPD) patients and are easier to use than inhalers (O’Driscoll BR et al., 1992). Chronic obstructive pulmonary disease (COPD) is characterized by chronic airflow limitation and a range of pathological changes in the lung, some significant extra pulmonary effects, and important co-morbidities which may contribute to the severity of the disease in individual patients. Thus, COPD should be regarded as a pulmonary disease, but these significant co morbidities must be taken into account in a comprehensive diagnostic assessment of severity and in determining appropriate treatment. Based on current knowledge, a working definition is: Chronic Obstructive Pulmonary Disease (COPD) is a preventable and treatable disease with some significant extra pulmonary effects that may contribute to the severity in individual patients. It’s pulmonary component is characterized by airflow limitation that is not fully reversible. The airflow limitation is usually progressive and associated with an abnormal inflammatory response of the lung to noxious particles or gases (Soriano JB et al., 2005). Chronic obstructive pulmonary disease is an extremely important cause of morbidity and mortality. For example, the prevalence of COPD more than doubled between 1990 and 2002, making it the fourth leading cause of death in the United States. Furthermore, it is projected to be the third leading cause of death by the year 2020. This increase in prevalence of COPD is felt to be related to the aging of the population and past smoking behavior, because COPD death rates and prevalence lag behind smoking rates by several decades. Because the smoking rates for women peaked later than rates for men, the increase in COPD prevalence in the United States is related primarily to an increase in COPD among women. The economic impact of COPD is also significant, with estimated annual treatment costs exceeding $30 billion. This includes health care expenditures of $18 billion and indirect costs of $14 billion (e.g., lost earnings because of illness or early death). A major cause of disability, COPD currently is considered the 11th leading cause of disability worldwide. Current projections suggest that by the year 2020, COPD will be the 5th leading cause of disability worldwide, behind only ischemic heart disease, major depression, traffic accidents, and cerebrovascular disease (Mary Anne Koda-Kimble et al., 2005). COPD is a leading cause of morbidity and mortality worldwide and results in an economic and social burden that is both substantial and increasing. COPD prevalence, morbidity, and mortality vary across countries and across different groups within countries but, in general, are directly related to the prevalence of tobacco smoking although in many countries, air pollution resulting from the burning of wood and other biomass fuels has also been identified as a COPD risk factor (Tirimanna PR et al., 1996). Morbidity: Morbidity measures traditionally include physician visits, emergency department visits, and hospitalizations. Although COPD databases for these outcome parameters are less readily available and usually less reliable than mortality databases, the limited data available indicate that morbidity due to COPD increases with age and is greater in men than in women (Morbidity & Mortality: Chart book 1998; Soriano JR et al., 2000; Chapman KR, 2004). In these data sets, however, COPD in its early stages (Stage I: Mild COPD and Stage 2: Moderate COPD) is usually not recognized, diagnosed, or treated, and therefore may not be included as a diagnosis in a patient’s medical record. Morbidity from COPD may be affected by other co-morbid chronic conditions (Schellevis FG et al., 1994) (e.g., musculoskeletal disease, diabetes mellitus) that are not directly related to COPD but nevertheless may have an impact on the patient’s health status, or may negatively interfere with COPD management. In patients with more advanced disease (Stage III: Severe COPD and Stage IV: Very Severe COPD), morbidity from COPD may be misattributed to another co morbid condition. Another way of estimating the morbidity burden of disease is to calculate years of living with disability (YLD). The Global Burden of Disease Study estimates that COPD results in 1.68 YLD per 1,000 population, representing 1.8% of all YLDs, with a greater burden in men than in women (1.93% vs 1.42%) (Lopez AD et al., 2006; Murray CJL. Lopez AD, 1996; Murray CJ. Lopez AD 1997). The lowest estimates of prevalence are usually those based on self-reporting of a doctor diagnosis of COPD or equivalent condition. For example, most national data show that less than 6% of the population has been told that they have COPD. This likely reflects the widespread under recognition and under diagnosis of COPD as well as the fact that those with Stage I: Mild COPD may have no symptoms, or else symptoms (such as chronic cough and sputum) that are not perceived by individuals or their health care providers as abnormal and possibly indicative of early COPD (van den Boom G et al., 1998). It is recognized that defining irreversible airflow obstruction as a post bronchodilator FEV1/FVC ratio less than 0.70 leads to the potential for significant misclassification, with under diagnosis (false negatives) in younger adults and over diagnosis (false positives) over age 50 years (Hnizdo E et al., 2006; Roberts SD et al., 2006; Celli BR et al 2003). Many additional sources of variation can affect estimates of COPD prevalence, including sampling methods, response rates, quality control of spirometry, and whether spirometry is performed pre or post bronchodilator. Samples that are not population-based and poor response rates may give biased estimates of prevalence, with the direction of bias sometimes hard to determine (Sterk PJ, 2004). 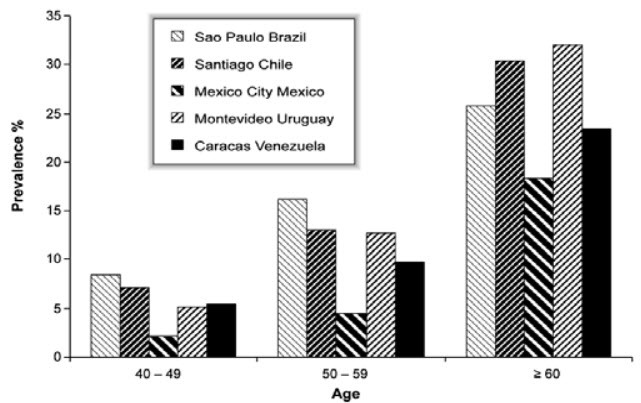 The Latin American Project for the Investigation of Obstructive Lung Disease (PLATINO) examined the prevalence of post-bronchodilator airflow limitation (Stage I: Mild COPD and higher) among persons over age 40 in five major Latin American cities each in a different country-Brazil, Chile, Mexico, Uruguay, and Venezuela. In each country, the prevalence of Stage I: Mild COPD and higher increased steeply with age, with the highest prevalence among those over 60 years, ranging from a low of 18.4% in Mexico City, Mexico to a high of 32.1% in Mentevideo, Uruguay. In all cities/countries the prevalence was appreciably higher in men than in women (Menezes AM et al., 2005). Mortality: The World Health Organization publishes mortality statistics for selected causes of death annually for all WHO regions, additional information is available from the WHO Evidence for Health Policy Department. Despite the problems with the accuracy of the COPD mortality data, it is clear that COPD is one of the most important causes of death in most countries. The Global Burden of Disease Study has projected that COPD, which ranked sixth as the cause of death in 1990, will become the third leading cause of death worldwide by 2020 (Lopez AD et al., 2006; Murray CJL. Lopez AD, 1996; Murray CJ. L Lopez AD, 1997). Trends in mortality rates over time provide further important information but, again, these statistics are greatly affected by terminology, awareness of the disease, and potential gender bias in its diagnosis (Jemal A et al., 2005). Smoking is the best-studied COPD risk factor, it is not the only one and there is consistent evidence from epidemiologic studies that nonsmokers may develop chronic airflow obstruction (Celli BR et al., 2005; Behrendt CE, 2005). Genes: COPD is a polygenic disease. The genetic risk factors severe hereditary deficiency of alpha-1 antitrypsin, a major circulating inhibitor of serine proteases (Stoller JK et al., 2005). A significant familial risk of airflow obstruction has been observed in smoking siblings of patients with severe COPD. Suggesting that genetic factors could influence this susceptibility (McCloskey SC et al., 2001). Inhalational Exposures: Each type of particle, depending on its size and composition, may contribute a different weight to the risk, and the total risk will depend on the integral of the inhaled exposures. Of the many inhalational exposures that may be encountered over a lifetime, only tobacco smoke, occupational dusts and chemicals are known to cause COPD on their own (US Surgeon General. The health consequences of smoking: chronic obstructive pulmonary disease 1984; Burrows B et al., 1977). Tobacco Smoke: Cigarette smoking is by far the most commonly encountered risk factor for COPD. Cigarette smokers have a higher prevalence of respiratory symptoms and lung function abnormalities, a greater annual rate of decline in FEV1, and a greater COPD mortality rate than nonsmokers (Jindal SK et al., 2006). Oxidative Stress: The lungs are continuously exposed to endogenous and exogenous oxidants. In addition, intracellular oxidants, such as those derived from mitochondrial electron transport, are involved in many cellular signaling pathways. Lung cells are protected against this oxidative challenge by well-developed enzymatic and non-enzymatic systems. When the balance between oxidants and antioxidants shifts oxidative stress occurs (MacNee W et al., 2005). Gender: The role of gender in determining COPD risk remains unclear (US Surgeon General, 1984). In the past, most studies showed that COPD prevalence and mortality were greater among men than women. Studies from developed countries show that the prevalence of the disease is now almost equal in men and women, which probably reflects changing patterns of tobacco smoking. Some studies have suggested that women are more susceptible to the effects of tobacco smoke than men (XuX et al., 1994; Anthonisen NR et al., 1994). Large (Central) and Small (Peripheral) Airways: The large airways, which include the trachea and ﬁrst generations of the bronchi, are a major site of inﬂammation and mucus hypersecretion. This results from an increase in numbers (hyperplasia) and enlargement (hypertrophy) of the sub mucosal glands and mucus producing goblet cells within the surface epithelium. Overproduction of mucus in the large airways results in a chronic productive cough, as observed in chronic bronchitis, but this does not have a major impact on airﬂow limitation. Mucus hypersecretion coupled with impaired ciliary function, reduces mucociliary clearance, increases the accumulation of secretions, and enhances the risk of bacteria colonization. As a result, recurrent infections often occur. The peripheral airway is composed of the smaller bronchi down to the terminal bronchioles, the smallest branches in the lung that are not involved in gas exchange. The extent of inﬂammation, ﬁbrosis, and airway exudate in the peripheral airway correlates best with the reduction in airﬂow as measured by a decrease in FEV1 or the FEV1/FVC ratio. Chronic obstruction of the peripheral airway also results in air trapping on expiration, which contributes to hyperinﬂation. It is now known that hyperinﬂation can occur early in the course of COPD and is an important cause of exertional dyspnea. Parenchymal Destruction: The terminal bronchioles lead directly to the alveolar ducts and sacs, the major site where gas exchange occurs. Emphysema is characterized by the destructive loss of alveolar walls and enlargement of the terminal airspaces resulting in a loss of gas-exchanging surface area. In advanced cases, large, balloon-shaped bullous lesions may develop. Rupture of these bullae can lead to collapse of lung segments (pneumothorax). Signiﬁcant Comorbid Illness: In the later stages of disease, chronic hypoxemia causes persistent vasoconstriction in the lung vascular bed, particularly the small pulmonary arteries. This can result in permanent structural alteration of the blood vessels causing intimal hyperplasia and smooth muscle hypertrophy. The loss of pulmonary capillaries in emphysema can also contribute to increased pulmonary vasculature pressures. The cumulative impact of vascular changes can result in progressive pulmonary hypertension and eventually, right-sided cardiac failure. The clinical consequences include progressive dyspnea on exertion, chronic cough and sputum production, increased risk for respiratory infections. Alpha-1 Antitrypsin Deﬁciency: The best characterized anti protease in the lung is α1antitrypsin. This serum glycoprotein is primarily produced in the liver and works by binding to and neutralizing proteases. Cigarette smoke can activate and attract inﬂammatory cells into the lung, there by promoting the release of proteases. Cigarette smoke can also inactivate endogenous protease inhibitors, including α1-antitrypsin, further supporting protease activity. This risk of tissue damage is greatly accentuated in patients with α1-antitrypsin deﬁciency (Mary Anne Koda-Kimble et al., 2005). Dyspnea: Dyspnea, the hallmark symptom of COPD, is the reason most patients seek medical attention. Typical COPD patients describe their dyspnea as a sense of increased effort to breathe, heaviness, air hunger or gasping (Simon PM et al., 1990). However, the terms used to describe dyspnea vary both by individual and by culture (Elliott MW et al., 1991). Cough: Chronic cough, often the first symptom of COPD to develop, is often discounted by the patient as an expected consequence of smoking and/or environmental exposures. Initially, the cough may be intermittent, but later is present every day, often throughout the day. The chronic cough in COPD may be unproductive. In some cases, significant airflow limitation may develop without the presence of a cough (Georgopoulas D. Anthonisen NR, 1991). Sputum Production: COPD patients commonly raise small quantities of tenacious sputum after coughing bouts (Definition and classification of chronic bronchitis for clinical and epidemiological purposes, 1965). Sputum production is often difficult to evaluate because patients may swallow sputum rather than expectorate it. The presence of purulent sputum reflects an increase in inflammatory mediators, and its development may identify the onset of an exacerbation (Hill AT et al., 1999). Wheezing and Chest Tightness: Wheezing and chest tightness are nonspecific symptoms that may vary between days, and over the course of a single day. These symptoms may be present in Stage I: Mild COPD or Stage III: Severe COPD and Stage IV: Very Severe COPD. Audible wheeze may arise at a laryngeal level and need not be accompanied by auscultatory abnormalities. Alternatively, widespread inspiratory or expiratory wheezes can be present on listening to the chest. An absence of wheezing or chest tightness does not exclude a diagnosis of COPD, nor does their presence confirm a diagnosis of asthma (Schols AM et al., 1993). • Central cyanosis, or bluish discoloration of the mucosal membranes, may be present but is difficult to detect in artificial light and in many racial groups. • Common chest wall abnormalities, which reflect the pulmonary hyperinflation seen in COPD, include relatively horizontal ribs, “barrel-shaped” chest, and protruding abdomen. • Flattening of the hemi-diaphragms may be associated with paradoxical in-drawing of the lower rib cage on inspiration, and widening of the xiphosternal angle. • Resting respiratory rate is often increased to more than 20 breaths per minute and breathing can be relatively shallow (Loveridge B et al., 1986). • Patients commonly show pursed-lip breathing, which may serve to slow expiratory flow and permit more efficient lung emptying (Bianchi R et al., 2004).